i love spring makeup trends. something about the promise of sunny days ahead warms my soul. after attending Spring/Summer 2013 Mercedes Benz Fashion Week i have been chomping at the bit to start putting some of those fashions into effect. 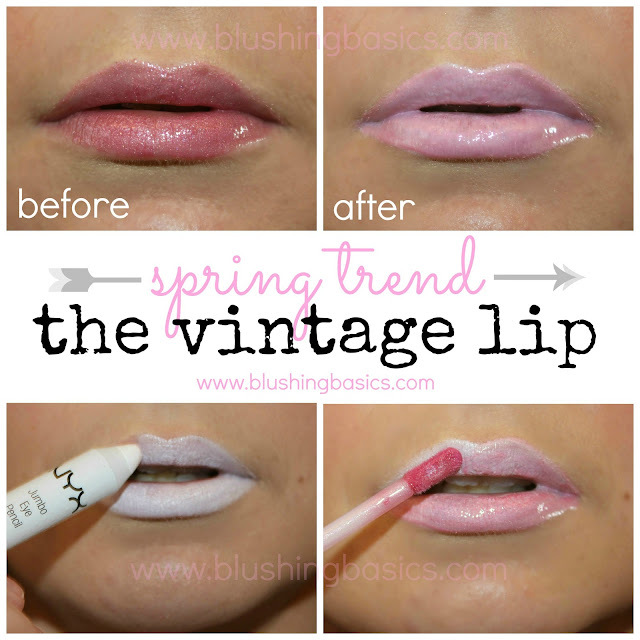 last week i received my Nordstrom spring catalog and this pastel vintage lip was rampant among the catalog models. i loved it. spring trends typically focus around pastels and spring 2013 makeup trends are no exception. the above before and after pictures are showing the exact same lipgloss, however the second photo has the white base coat. using my NYX Jumbo Eye Pencil, i applied a white base coat. following that i topped it with my rose pink lipgloss. I had never really thought of using a white to lighten a shade. That's a great idea! I just learned the trick to put foundation on lips to lipstick true to color. I like the first one also..